But WHY is Portal 2's Music so Great? One of the highlights of Portal 2, like it was with the first game, is its music. Most will agree that it's a wonderful soundtrack, perfect to accompany the on-screen action, but just why is that the case? Dan Bruno has an idea, and it uses sound editor Walter Murch's theory of the "aural spectrum". According to this spectrum, speech (which is "encoded" sound) lies at one end, the "violet end", with music (which is "embodied", in other words, raw sound) at the other end. The "red" end. Lying between those two are sound effects, which are both "embodied" in that they're raw sound, but also "encoded" in that they require an understanding of what they're representing for us to understand them. They're "yellow". That's the simple version; for the full thing, you can read it in detail here. Anyway, Bruno's idea, and I like where he's going with this, is that Portal 2 lies between the violet and the red in an "orange" point on the spectrum, because it pushes "sound effects and music towards each other". 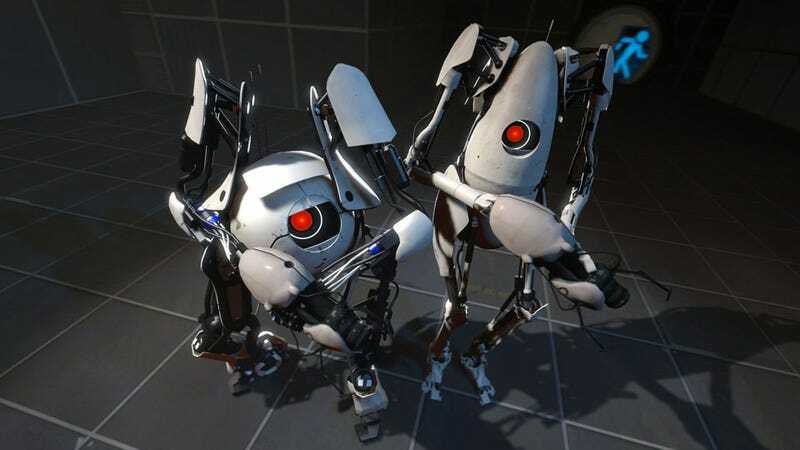 He argues, with embedded examples, that Portal 2's sound effects work as musical events, programmed to form as much a part of the soundtrack to your progression as the actual, well, soundtrack. Combine this with the fact Portal 2 already has an "interactive soundtrack" of sorts, with music changing in tempo depending on what you're doing, and you can see where this all comes together. You can hear examples for yourself at the link below, the best probably being the "floaty high-pitched arpeggio" you hear when bounding off a jump pad.